When you are installing drywall, often building code dictates certain types of drywall that must be used. One type of drywall that shows up in building codes is what is commonly called fireproof drywall. More accurately, its true name is Type X drywall or fire-rated drywall. While beneficial, fire-rated drywall is often given more attributes that it truly has. This drywall is fire-rated but not fireproof. Type X drywall is only one of many methods homeowners should use to retard fire, and testing procedures are deemed imperfect. Fireproof drywall is the pejorative term; its industry name is Type X drywall. The thickness of this drywall is 5/8-inch, including all layers. Glass fibers are added to the board to help it retard fire. Also, because it is denser than normal gypsum-and-paper drywall, it takes longer for the fire to degrade it. Most Type X drywall has a one-hour fire rating. As added benefits, Type X absorbs sound slightly better and is slightly stronger than conventional 3/8-inch or 1/2-inch drywall. Type X is by no means 100-percent fireproof. Simply it is drywall that will stand up against flame longer than regular drywall. Also, just because an area is covered in Type X drywall does not ensure fire safety for that area, since fire can still find other pathways, such as vents, doors, gaps, cracks, and unblocked stud wall assemblies. If a conventional 1/2-inch thick sheet of drywall will stand up to 30 minutes of fire, then the added 1/8-inch found in the Type X drywall, along with its other properties, will double your margin of safety to 60 minutes. For this reason, fire-rated drywall is sometimes called one-hour fire wallboard. Why Not Use Type X Drywall Everywhere? Fire-rated drywall tends to run about 20-percent more expensive than conventional drywall panels. While this is not much in the small scale, it can represent a substantial cost difference when multiplied across an entire home's worth of drywall. More importantly, the fire will find any number of easier passages to travel than through drywall. 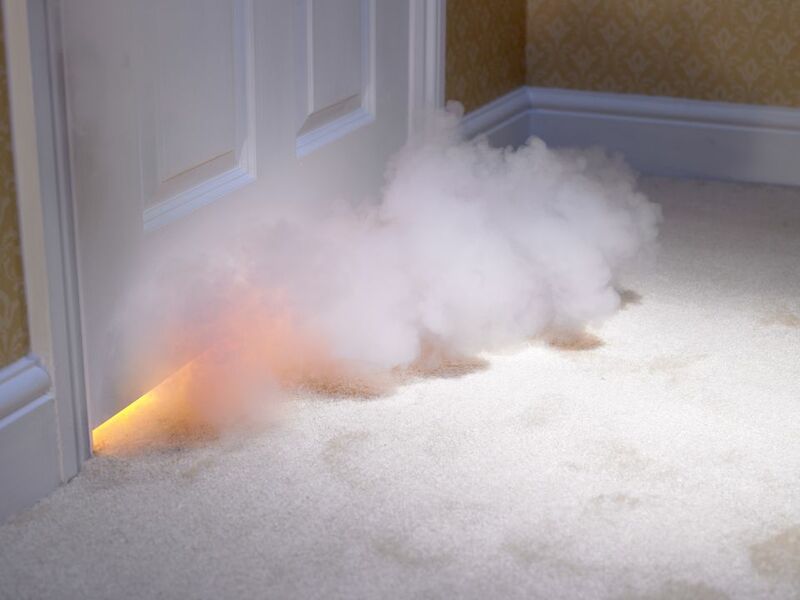 For example, if a bathroom, nursery, bedroom, or home office were hung with Type X drywall, the fire would readily move through oxygen-rich open doors and hollow-core doors long before attempting to burn through the drywall. If you want fire-rated drywall to be installed all throughout your house, you would need to request this with the contractor, as this is not normally done. The ability of Type X to withstand fire is tenuous and not fully understood, at least according to one major manufacturer of fire-rated drywall. USG is the manufacturer of Sheetrock Brand Firecode C Gypsum Panels. USG makes the point that ASTM (American Society For Testing and Materials) testing of fire-rated drywall requires that entire "assembly/systems" be tested, not just the drywall. This simply means that for a "one-hour fire rating" of a gypsum board assembly/system, all requirements of an ASTM E 119 test were successfully met in a testing laboratory furnace for at least 59 minutes and 30 seconds for that specific assembly/system and with those specific components of the assembly/system. Drywall typically comes in 1/4-inch, 3/8-inch, and 1/2-inch thicknesses. Type X drywall is 5/8 inches thick. In addition to the usual gypsum found in regular drywall, fire-rated drywall contains glass fibers to form a super-tough core. Finally, the gypsum and fiberglass are packed tighter and denser than with regular drywall. Fire-rated drywall costs more than the regular drywall. As a rule of thumb, you can count on it costing about 10 percent to 20 percent more than conventional drywall of the closest possible thickness. Type X fire-rated drywall is not a specialty product. It is available at local home improvement stores or contractors' supply houses.